If a game is going to stay in your collection, it should fill a niche. It should do something well that nothing else in your collection provides. To me, Viceroy takes a relatively simple concept, building a tableau of cards, and transforms it into remarkably enjoyable puzzle that feels just thematic and open-ended enough to keep it interesting. There are a lot of games out there about laying down cards in a pattern, but none with such a unique sense of simultaneous action, competition for resources and solitaire problem solving. Viceroy was a surprising game for me that I wanted to play again almost immediately afterwards. The object of Viceroy is to create a tableau of cards in the shape of a pyramid, scoring points in a wide variety of ways. As soon as you place two cards next to each other, that opens up a spot to place a card on the level above, like bricks in a wall. When placed, cards grant a one-time award, generally some number of gems, points, tokens, bonuses or additional cards. In addition, you are trying to complete circles of the same color by arranging the card placements so that the colors on the corners and edges of the cards match. When you do this, you get a free gem after you place the card and points at the end of the game, according to how high up in your pyramid the circle is. I really enjoyed how the puzzle aspect of playing the cards and matching the colors existed alongside and entirely independent from any of the card bonuses. Trying to make these two separate tracks play out in parallel was an interesting challenge that added a lot of complexity, without making the gameplay overly complicated. The circles can add up to quite a lot of points at the end of the game, so it’s worth paying attention to! That said, I also appreciated how it was always an option to completely ignore the circles so it didn’t limit you in your placement of the cards, but rather as an opportunity to create some compelling synergies. I’d like to see other games try out the parallel tracks concept. When it works as well as it does here, it reminds me a lot of counterpoint in music, where the interaction of two simple melodies can create surprising moments. The game begins by dealing out four character cards, three law cards, and six starting gems to each player. Players then choose one character card to be the first card in their pyramid for free (gaining the level one award) and one card to remain in their hand, shuffling the other two back into the deck. In the middle of the play area, four color markers are placed in a row, indicating the four colors of gems: red, blue, green, and yellow. The first round of play opens with four cards being dealt from a stack of 48 character cards to form an offer. Each of these four cards is placed under one of the four color cards. Players then try to buy one of these cards by bidding one gem of the appropriate color – if the card you want is under the blue card, bid blue! As indicated above, to buy one of the four cards on offer, players make a secret bid by placing the appropriate gem in a closed fist. All players then reveal at the same time. If you’re the only one that bid for a certain color, then you take the card and sit out any further bidding for the round. You can only buy one card per round, greedy! However, if two or more players bid the same color, then those players lose their gems and get nothing. The bidding continues the same way two more times. As long as they have another gem of the right color, they can continue to bid on the same card. After three bidding rounds, any player who didn’t win a card collects 3 gems. This system may seem chaotic and I had my doubts going in, but it really works well. Players are also highly encouraged to discuss which cards they intend to go after to avoid needless losses. Like I mentioned, I really enjoyed this bidding mechanism and I enjoyed discussing aloud which card I was wanting to go for. There’s a lot of options in this game and not a whole lot of reasons (until later in the game anyway) to choose a card just because someone else wants it. Most likely they’d be able to accomplish what they want using another combination of cards. But in the odd case that two players really wanted the same card, the war of attrition that follows was interesting and even a tad thematic. I’ve got more blues than you, so I can wait you out if you insist on matching me. Or perhaps I can spare a blue gem, but I know that you cannot so I’m going to match you just to make you pay two gems instead of one. This type of min-maxing might have been tiresome had gems been public knowledge, but with the player screens it really works. Paying attention to what your opponents have taken and spent in past rounds can turn out to be a big advantage. Gear, Scroll, Shield and Sword. Tokens a-gogo!! Players are also able to voluntarily opt out of the whole bidding process by showing an empty hand on reveal, at which point they take an immediate 3 gems from the supply. Not something you’d want to do very often, but an effective way to grab gems when you’re trying to plan your next moves. After each bidding round, players get three opportunities to place cards from their hand into their pyramid, which they can play or pass at their option. Players place their cards simultaneously for the most part, with any timing conflicts (such as running out of a certain color of gem) being addressed by the numbering on the cards, lowest acting first. There is an element of solitaire here, which may be somewhat off-putting to some players. It really doesn’t matter a whole lot what cards other people are playing or whether they are placing cards while you are passing. There’s no real advantage to having more cards in the pyramid at any given point during the game, and in general players will have the same number of cards, so it can be a very powerful strategy to hold back, accumulate cards and play three in a row in a single round. If you grab a card for its fourth level award, it does you no harm to leave that card until you can chain a few plays together in a single round. Every round, four more cards are dealt. Since these offer cards are dealt 4 at a time from an initial stack of 48, a game of Viceroy will last exactly 12 rounds (math! division!). For each subsequent bidding round after the first, any cards not taken are moved up above the color cards and 4 more are dealt out beneath. At this point, players can still take only one card but are able to choose which of the cards, either above or below the color card, they will take. And if two players bid the same color and there are two cards available, they can agree among themselves which one to take. The highest possible level is 5, and if a player gets there it means they have placed at least 14 cards (in addition to the starting card). Since players start with 1 character card and 3 law cards in hand, they will generally have to acquire a card in least 10 of the bidding rounds if they plan to reach level 5. I only mention this to offer some context as to how many of the 12 bidding rounds players would need to gain cards vs passing for gems. Some of the card awards grant free law or character card selections (which you take from another stack, not the stack you deal the offer from), so it’s possible to end up with quite a few cards, but that also means your awards are not granting you any gems or points. It tends to even out in the long run. As I’ve mentioned, character cards grant various awards. Many cards grant tokens in the form of swords, gears, shields, and scrolls. Swords, which are hidden behind your player screen, can be spent in place of gems for bidding, but any kept until the end of the game will deduct points from your opponents. Gears allow players to collect extra gems when passing. Shields defend against any swords held by your opponents (something else for you to remember!). Scrolls aren’t worth anything on their own, but can be paired with bonus point tokens to create lots of points for each scroll. And finally, any set of Gear, Shield, and Scroll scores points. Many cards grant gems, either in a one-time lump sum or a permanent “infinite” gem that can be used to pay costs throughout the game. Some cards grant a specific number of points directly and some grant additional point bonuses for scrolls, completed circles and infinite gems. There are lots and lots of ways to score points efficiently in this game, but interestingly enough there are almost as many ways to waste your time placing cards that aren’t going to help you at all. Especially as the game advances and your card placements are becoming expensive, you really have to focus on what each card is doing for you and deliberately go after various bonuses to augment your score. It really is impressive that even with so many ways to score points, it’s actually quite difficult to simply fall into them accidentally. Viceroy is basically a timed efficiency contest, so if that type of game appeals to you then you will not be disappointed. 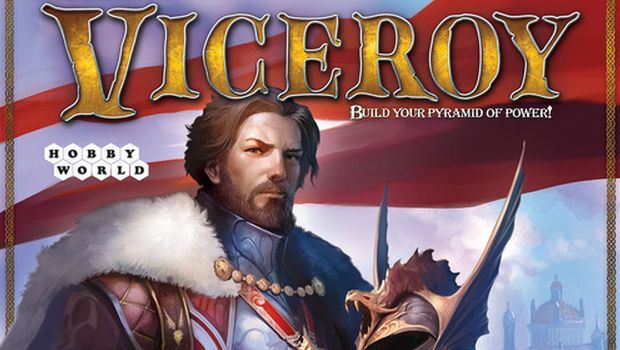 The artwork in Viceroy is absolutely brilliant (should garner some award nominations) and the components are top notch as well (with the notable exception of the box itself – seriously guys, just find out who does Days of Wonder’s boxes and go from there). There was an effort made to distinguish colors for color-blind gamers – I myself see colors fine so not sure how helpful or effective it turned out to be, but I’m glad to see the effort made. Graphic design on the cards and chits is clear, intuitive and strongly supports the theme. Add in a rule book that is excellently written and logically organized and you have yourself a really tremendous and surprising game. I truly enjoyed playing Viceroy. Options felt plentiful throughout, and I never felt forced into a certain path. Setting up your future actions felt exciting and gave me a sense of anticipation rather than following a tedious and rote path. The game design and mechanisms deserve most of the credit here, but I’d be remiss not to mention how beautiful the game is to behold. A remarkable value for the price.